I have basically forgotten that this blog exists. It’s crazy to look back at it though and see Scientia starting and being reminded of the joy of discovering that we had a ton of local climbs that I had just never known about. I started climbing in the Santa Monicas in 2011 right before the birth of my first son as a way to get outside while not having to drive two hours to get there (although with the LA traffic that can still sometimes be a challenge). I had never really looked around that much locally for bouldering and had mainly been drawn to the Southern California mainstays like Black Mountain, Tramway, and Joshua Tree in my early years of climbing. I’ll never forget the first time I went to the Purple Stones after digging through the Southern California Bouldering Guide by Craig Fry. Directions at this time were not well known and one of the descriptions that I had found for the approach to Purple Stones was described getting “a V7 for the sketch factor” as you walk down Topanga Canyon through blind corners with 2 feet between you and the cars screaming down the canyon. We hiked down to the entry point described and then proceeded to descend down a shrub and poison oak hill (all while my friend’s 2 year old was in tow) to get to the stream and then searched until we found the boulders eventually. I’m not sure if my friend ever went back but I was hooked. Flash forward 6 years and I’ve probably spent 95% of my climbing time locally and have met some of the best people I’ve ever known as a result. 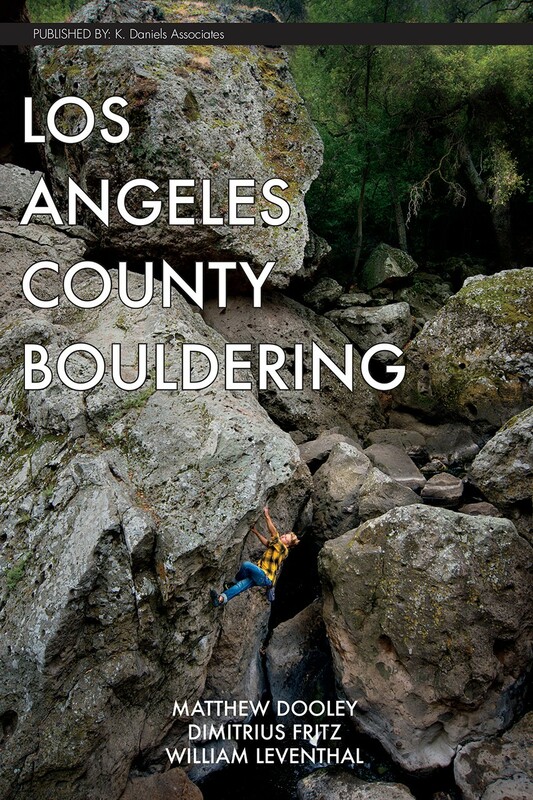 A couple years back I jumped on the LA County Bouldering guidebook project that Dimitrius Fritz and Bill Leventhal had been working for a few years. With our combined knowledge of the local scene we poured a ton of effort into creating the best bouldering guidebook that Los Angeles has ever seen. I’m stoked to say it’s finished and now available for the masses. I’m sure we’re bound to piss some people off and get some things wrong here or there, but I’m proud of what we accomplished and it’s amazing to see the guidebook finally in print. I think LA County is about to blow people’s minds. Guide is available for purchase here and it should be getting into REI and the local climbing gyms here soon. Hopefully I’ll have some books to sell here on the site as well shortly.